Following on from last weeks post ‘Australian Native Bees’ I’d like to tell you about another little native bee that visits our garden – the Australian Stingless Bee. We don’t see these little ones quite as often as the Blue Banded Bee or the Teddy Bear Bee but I think it is possibly because they are so, so tiny and silent. There are about ten species of Australian Stingless Bees in Australia, they are just 3mm to 4mm long, black and produce honey, although it is a small amount compared to the European honeybee. We have mostly seen this little one in our neighbour’s Crepe Myrtle. It is such a beautiful sight. They are so quiet and so very busy. 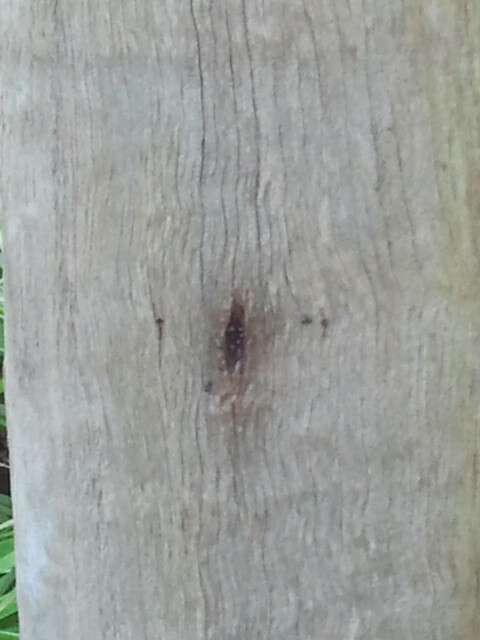 I have also seen them hovering around tree hollows when I have been out bushwalking. The Stingless Bees live in colonies, which means that they have a queen, drones and worker bees. They live inside tree hollows or purpose built wooden boxes (you can purchase these boxes). Aboriginals have used the honey from the nests for centuries for food and for medicinal purposes and the resins from the nests as glue to make tools and weapons. 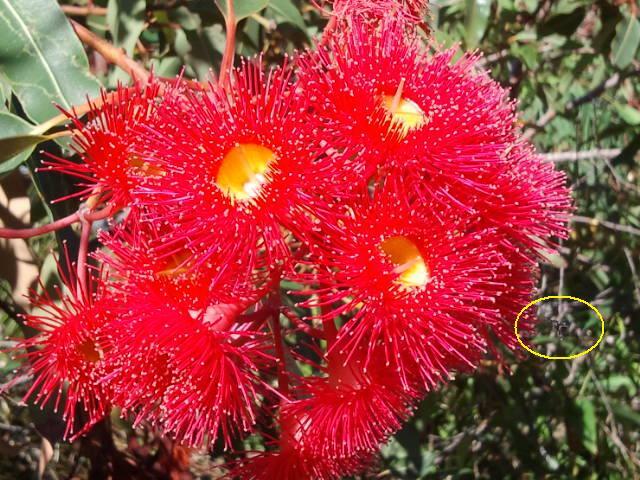 The picture below is of an Australian Stingless Bee visiting a gorgeous flowering Eucalyptus. I was lucky to get even this picture, they are very quick as well as being small so a zoom on a smart phone is not an ideal way to capture such an image. 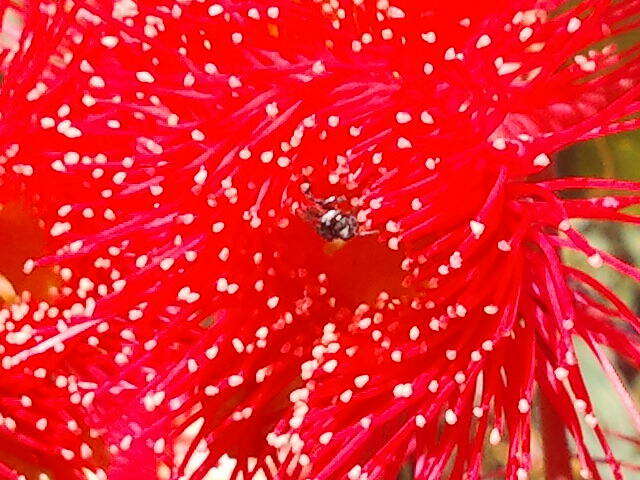 An Australian Native Stingless Bee visiting a gorgeous flowering gum. 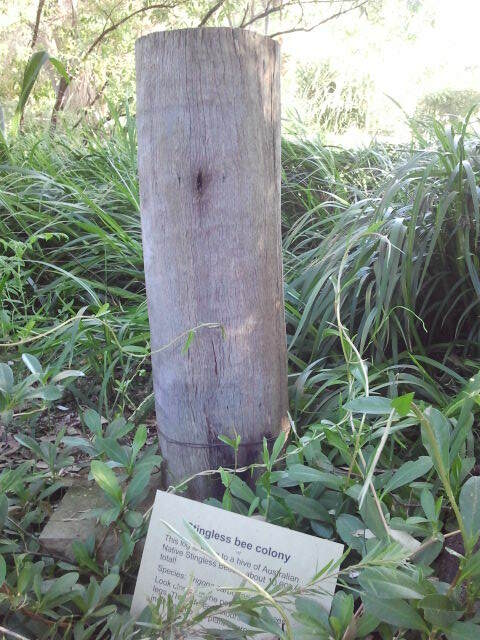 At the Royal Botanic Gardens Sydney there is a great example of a Trigona carbonaria species nest near the Maiden Theatre, I’m sure if you asked at the information desk they would happily guide you to where it is. A friend of ours has had a Stingless Bee hive (also known as Sugarbag Beekeeping) for many years now and we are excited about receiving half of his hive when it is ready to be split. I am so looking forward to that and will keep you posted on the progress of it, how we do it and where it will live once we have it in our garden. Are you a Sugarbag Beekeeper? I’d love to hear how it is going. Click here to read my previous post about Australian Native Bees and for links to further information on Australian Native Bees and Sugarbag Beekeeping.